Over the last few years, Norway’s eclectic music scene has been thriving, as familiar faces and new bands release albums of ambitious, exciting and innovative music. This includes the improv trio Miman, who recently released their much-anticipated debut album Ulme, on Motvind Records. Having released Ulme, Miman embarked upon a European tour, and spent a month playing in ten countries where audiences embraced the trio’s distinctive genre-melting sound. By the time Miman returned home from their latest tour, the rising stars of the Scandinavian jazz and improv scene had won many new friends. For Miman, this brought to an end the latest chapter in a story that began a few years ago. That was when fiddler Hans Kjorstad, guitarist and clarinetist Andreas Røysum and bassist and synth player Egil Kalman decided to form a group together, which they decided to call Miman. This was seen as an exciting development, as the three members of Miman were already active members of the vibrant Scandinavian jazz and improv scene, and many critics and commentators thought that they had a big future ahead of them. Especially when the three young musicians joined forces, and embarked upon a career together as Miman. As the nascent band began honing its sound, it soon became apparent that three members of Miman came from very different backgrounds, and had been shaped by disparate musical influences. This worked in their favour, as they each brought something new to the table, including Norwegian, English and Indian folk which the members of Miman fused with free jazz and modern music. However, at the centre of Miman’s new and exciting genre-melting sound was improvisation. Improvisation has always been hugely important in music, and in a way, separates the great musicians from those that are merely good. There are many talented musicians who are capable of reading music and playing what’s expected of them. However, ask them to improvise and they’re unable to do so. It seems that they’re unable to think on their feet, and take the music in a new direction. This seems to be beyond many good musicians, but for many top blues, folk and jazz musicians, this is something they’re able to do with ease. It’s something that has come naturally to many musicians, including the three members of Miman. That has been the case since Miman took their first tentative steps onto the live scene. Since then, the three members of Miman’s distinctive voices have combined to create an organic sound where the textural and tonal combines with the acoustic and electric, as disparate musical genres melt seamlessly into one. This found favour initially with local audiences, but before long, further afield. Soon, Miman were touring Europe, and their unique brand of improv was being embraced by a much wider and appreciative audience. By then, Miman were already regarded as one of the rising stars of the Scandinavian improv scene. However, there was one thing missing from their CV…their debut album. The three members of Miman realised this, and decided that having spent several years playing live, they were more than ready to record their debut album. Miman planned to record their debut album Ulme in a cabin in the woods to the north of Oslo over a three-day period in the spring of 2017. On Thursday the ‘9th’ of March 2017, the members of Miman were in the log cabin in Farmasihytta, where they would spend the next three days recording their debut album Ulme with recordist Magnus Skavhaug Nergaard. Violinist Hans P. Kjorstad was joined by guitarist and clarinetist Andreas Røysum and double bassist Egil Kalman who also played synths on two tracks. Miman succeeded in recording their debut album in just three days, and by Saturday the ‘11th’ of March 2017, they had recorded Ulme. This just left Ulme to be mixed and mastered. Ulme was mixed at Flerbruket by recordist Magnus Skavhaug Nergaard, and then mastered at Strype Audio by Audun Strype. This meant that Ulme was almost ready for release. All that was required was an album cover. Fortunately, Miman had the perfect idea for the cover of Ulme. 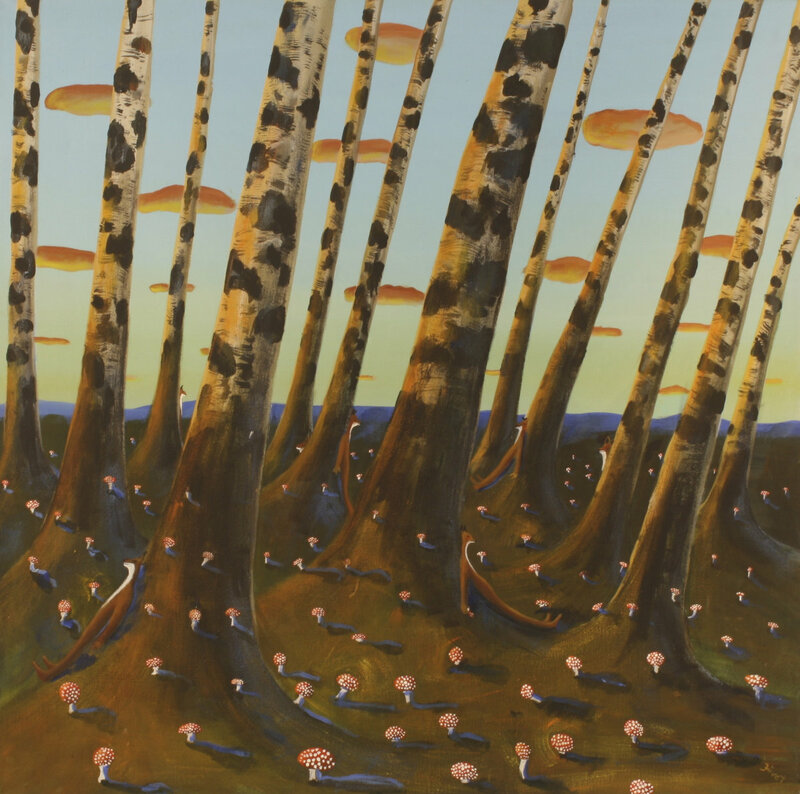 They wanted to use Morten Juvet’s distinctive painting Reverus, which was guaranteed to make Ulme standout from the crowd. Having received permission to use Reverus for the cover of Ulme, now Miman could prepare to release their much-anticipated debut album. To promote Ulme, Miman organised a pan European tour that would see them play venues in Denmark, Sweden, Norway, Russia, Poland, Germany, Slovakia, Austria, Italy and finally Norway. Each night, of their European Tour, a new audience embraced Miman’s distinctive genre-melting sound which features on Ulme. Opening Ulme is Omkring Ilden, which straight away, has a joyous, melodic sound before a scratchy, scrubbed violin is added. Soon, the guitar becomes louder and is played with conviction and confidence. By then, the flourishes of guitar provide a contrast to the heart-wrenching sound of the violin which could be a feature of many a Nordic or Celtic folk album. Meanwhile, the rest of the arrangement unfolds in waves, as the double bass augments the guitar and violin which play leading roles in this beautiful, poignant, genre-melting track. Andreas Røysum switches from guitar to clarinet which adds a rueful and ruminative sound on Vagen Ut, and is accompanied by a firmly plucked double bass and violin. It’s played in an inventive pizzicato style, as Hans P. Kjorstad plucks and picks the strings. Later, Andreas Røysum seems to overblow which is a technique free jazz musicians have been using since the late-fifties. This is effective, especially when the rasping, wailing clarinet is accompanied by the double bass which provides the heartbeat as Hans continues to improvise and transform the violin into a very different instrument that adds an array of disparate sounds to this captivating, dark, ruminative, improvised soundscape. As the arrangement to Det Vises Club scampers along, the guitar and violin play leading roles. Meanwhile, an assortment of squeaks, wails and leftfield sounds escape from the arrangement as Miman improvise and play as if their very life depends upon it. The guitar and violin are scratched and scrubbed urgently, and plink plonk, seesaw and wailing sounds join sci-fi synths as Miman play with an inventiveness. Occasionally a stray melodic crystalline guitar or melancholy violin escapes from the arrangement, but mostly, this is improv Miman style as they fuse elements of avant-garde, drone, electronica and folk. Especially during the last four minutes of this twelve-minute epic where the music is transformed and becomes melodic as avant-garde, drone and Nordic folk combine and bring to a close this ambitious musical roller coaster. On Torre, a slow and deliberate plucked violin combines with a wailing, bubbling, whistling, banshee-like clarinet that is played with urgency. Soon, the standup bass enters, and falls in line with the bass. At first they seem to have no intention of trying to keep up with the runaway clarinet. Soon, they decide to try to catchup with the clarinet, soon realise it would be impossible and return to playing at their own pedestrian pace. After that, the violin veers between haunting to melodic and latterly and otherworldly and latterly urgent, during what sounds like Miman’s modern day improvised adaptation of The Tortoise and The Hare. Skarvor opens with a sweeping, scratchy violin, before a guitar is plucked and an array of leftfield sounds are added and gallop along. By then, the violin is played with an urgency and an inventiveness, and sometimes it’s scratched and scraped, while a chirping, crystalline guitar adds a contrast. So do the galloping leftfield sounds and occasional sci-fi synths that are added to the soundscape. It features rising of stars of improv Miman, at their innovative best as they continue to push musical boundaries to their limits, and sometimes, beyond on Skarvor. Melodic, dramatic and hypnotic describes the introduction to Walden. The crystalline chiming guitar is melodic, while the violin adds a degree of drama and the bass adds a hypnotic backdrop. However, the guitar plays a starring role adding musical sunshine, before the scratchy, filmic violin adds a contrast as Hans improvises. Soon, the guitar returns and the two combine and the contrasting sounds combine successfully to create the most accessible and melodic track on Ulme. Cinematic describes the first few bars of Kartan Som Konstverk, where it sounds as if Miman are trying to replicate the sound of steam train. They then proceed to create the alternative soundtrack to the golden age of steam. Pizzicato strings combine with a firmly plucked and deliberate standup bass is played almost hesitantly. So too is the acoustic guitar, although the pizzicato string fill the void. Soon, the chirping guitar and bass combine and meander along before almost grinding to halt. After this happens again, the bass plays a starring role, and is joined by the violin for the remainder of this cinematic track that is full of imagery. Plaums Draum closes Ulme, and opens with a guitar that conjures up Spanish beaches as the sun sets. Meanwhile, the bass plays and soon, the plaintive cry of the violin enters and plays a heart-wrenching lambent. Suddenly, beaches and sunsets are far from the listener’s mind as once again Miman tug at the heartstrings, which seems fitting as this was how they opened their debut album Ulme. For anyone with even a passing interest in improv, Miman’s debut album Ulme is definitely an album to add to their collection. It’s the perfect opportunity to hear one of the rising stars of the Scandinavian free jazz and improv scene as they embark upon what’s hopefully a long and successful recording career. Miman is a group with a bright future ahead of them, and Ulme which has just been released on the newly established Motvind Records is proof of that. It features eight genre-melting tracks from Miman. They combine elements of avant-garde, electronica, experimental, folk, free jazz and musique concrète during Ulme, which features ambitious and innovative music from a pioneering group. Miman push musical boundaries to their limit, and sometimes, way beyond on Ulme, which is a tantalising taste of what this talented trio are capable of.